Front-loading washing machines make washing quilts easy, but top loaders can be adapted. Photo by Barb Gorges. From Part 9 we have the list of what we need before putting a quilt in a washing machine: color-fast fabric, Shout color-catcher sheets, quilt in good repair (not fragile antique), stains treated, Orvus soap–either from the feed store or the quilt shop, and clean front-loading machine. Don’t use other laundry products such as bleach or fabric softener. Orvus soap is a white solid at 65 degrees. Even if it’s warm enough to be a liquid, mix it with half a cup of warm water before pouring into the soap dispenser. A tablespoon is enough for a queen-sized quilt. 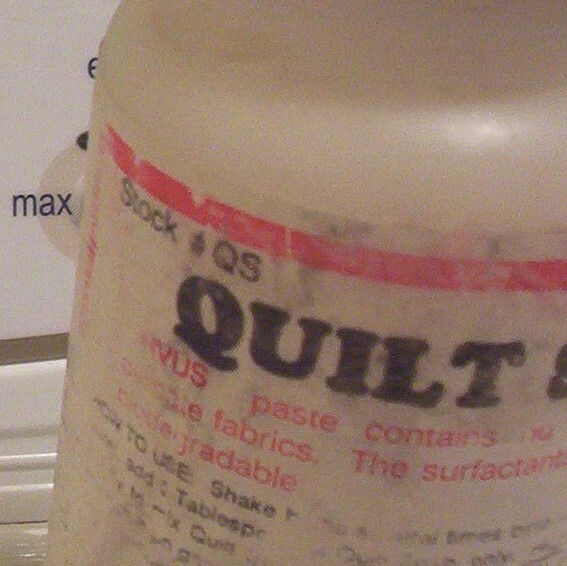 Use less for smaller quilts–too much and you will be rinsing forever. Set the machine for cold wash, cold rinse, and hand wash cycle—or the lowest amount of “agitation” possible. 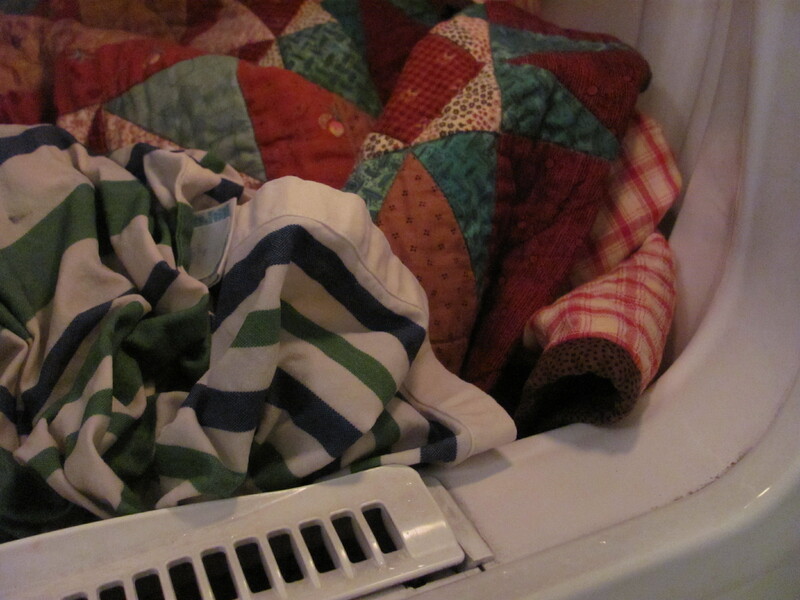 Add an extra rinse or plan to send the quilt through a complete wash cycle again without soap. The “Max Extract” spin setting is good. For top loaders, fill with lukewarm water. Mix in the soap. Turn the machine off and add the quilt. Use your hands instead of the agitation cycle for a few minutes, gently lifting and moving the quilt. Then let the quilt soak 10 minutes before setting the washer controls for the rinse cycle. Substitute your hands again for the agitation in the rinse cycle, then let it spin. With either machine, when finished, check immediately to see if there was any bleeding. If so, treat with stain remover and rewash immediately (and recheck immediately again)—and plan to dry that quilt fairly quickly in the dryer. Otherwise, check to make sure the quilt doesn’t sound soapy. If in doubt, run it through another washing again, without soap. Next issue we will discuss the finer points of drying quilts. Scroll down to read the first nine parts of this series. One of the best and most widely available quilt soaps is Orvus. Photo by Barb Gorges. You’ve done your best to keep your quilt dirt-free (Part 5) and you’ve aired it regularly to keep it smelling nice (Part 8), but now it needs to be washed. If you made the quilt, you already tested the fabrics for washability (Part 4). But if you didn’t make the quilt, and it has never been washed before, do a test for bleeding on these kinds of fabrics: color saturated, especially red and dark blue; any hand-dyed; and cheap fabrics. Wet a piece of white cotton fabric and rub it on the potential bleeder to see if the dye transfers. It doesn’t necessarily mean this excess dye will transfer to the rest of the quilt, but you’ll want to treat the quilt as if it would. 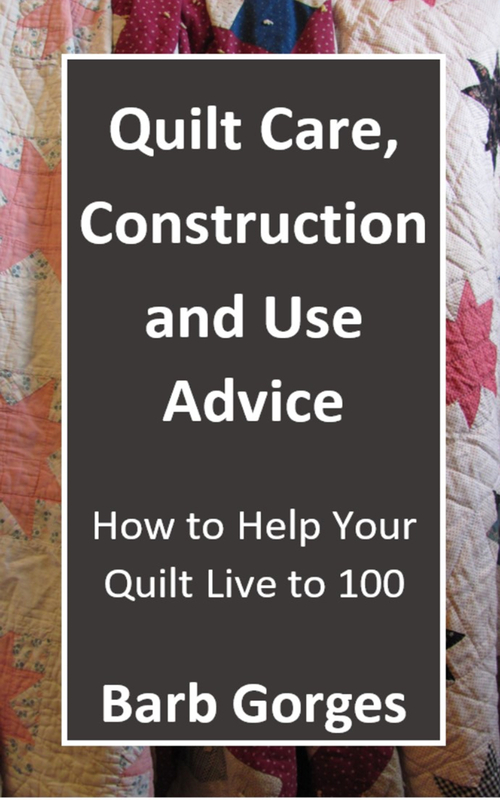 If the quilt is well-used, be sure to inspect it for any damage and sew up any tears and patch any holes. If this is a valuable antique quilt, let the experts repair the quilt (or instruct you on how to do it). However, the washing directions here are not for antique or fragile quilts. Find soap. It should be free of perfumes and additives, like Orvus quilt soap. If you might have bleeding problems, get a box of color catcher sheets, such as the Shout brand, and use multiple sheets per quilt. Find a front-loading washing machine. Avoid a commercial machine used for washing oily clothes or that has soap residue (run it empty to see if suds develop). A nearby dryer capable of very low heat settings is useful. Chlorine-free water would be nice. What you won’t need are bleach, fabric softener and any other laundry aids–unless the quilt has a stain. Then try one of the spray-on stain removers. Scroll down to read the first eight parts of this series.